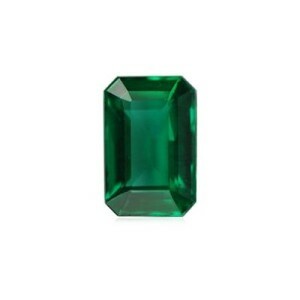 Emeralds are a green variety of the mineral beryl. Although their hardness is at the higher end of the Mohs scale (with a rating of 7.5-8), most emeralds are considered brittle because of the numerous natural flaws inside them. Here are some tips to help you select the best emerald for you when shopping. Most emeralds come in green color with faint bluish or yellowish hues. However, there are two additional color characteristics that you should consider when evaluating an emerald: the intensity and darkness of its color. 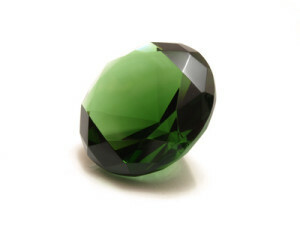 Intensity refers to how saturated the color of an emerald is: Some stones have more of a dull look, while others exhibit a more intense, vivid green. Darkness describes the tone of the color you can see in an emerald. This characteristic can vary from light to very dark green. 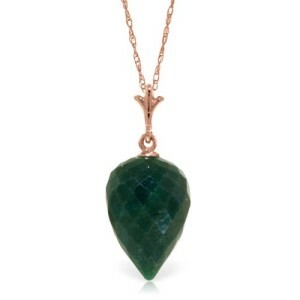 The emerald in this pendant has a dark green tone. When choosing an emerald, you should look at both the intensity and darkness of its color. Darkness is mostly a matter of personal taste, but you should know that the darkest emeralds are not necessarily the most expensive. 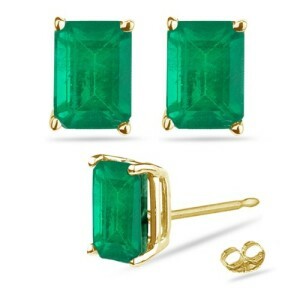 Click here to see a selection of the newest and most popular emerald jewelry. In fact, color intensity is even more important, and the higher it is, the higher the stone is valued. The most valuable emeralds tend to have a strong green color that is moderately dark. Moderately dark emeralds that also have an intense green color are the most valuable. Clarity refers to the number, size and visibility of the flaws found in an emerald. The internal flaws that occurred naturally when the gemstone was formed are called inclusions. You should expect to find inclusions in an emerald, some of them visible; in fact, if it doesn’t have any, it is likely to be a fake emerald (or created in a lab). When evaluating emerald for clarity, you should look at the stone with the naked eye and see if it looks clean. Emeralds should not have readily visible flaws that spoil the stone’s appearance. In general, inclusions in emerald should not be so big as to detract from its appearance. Numerous inclusions that are too large can compromise the stone’s structure and make the emerald more likely to break. Avoid emeralds with inclusions that are too close to the surface, especially if these flaws are in the form of long lines and cracks: Such inclusions make a stone more vulnerable to damage. In general, the fewer inclusions an emerald has and the less visible they are, the more valuable a stone is. Choose a stone with inclusions that are either invisible or barely visible to the naked eye, and avoid heavily included stones, which can easily break. When used in the context of gemstones, carat refers to the weight of a particular stone: One carat (denoted by 1 ct) is equal to 200 milligrams, or 0.2 grams. When it comes to carat, the bigger an emerald, the more expensive it is. In fact, an emerald that is twice as large as another stone of the same quality will not be twice as expensive, but the increase in price is likely to be much higher. 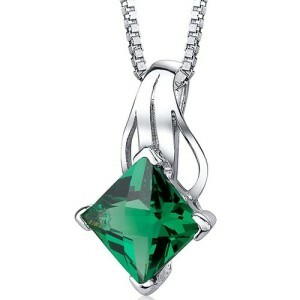 The reason for this is that bigger emeralds are very hard to find, and their rarity makes them very pricey. How big an emerald you would like to buy is up to you, but keep in mind that it is very hard to find a stone that is both large and top quality, and such an emerald would cost you a lot of money. The mounting your emerald is set in will determine how exposed its surface will be to occasional hits and bumps, which may damage it. Bezel settings hold the gemstone by encircling it with a metal band, fully or partially. V-prong settings are most suitable for stones with angular cuts (e.g., the classic emerald cut), as the prongs are shaped in the form of the letter “V” in order to grasp the stone firmly at its corners. A lot of emeralds on the market today are treated to enhance their appearance: The stones’ internal fissures that reach their surface are filled with oils and resins to make the flaws less visible. 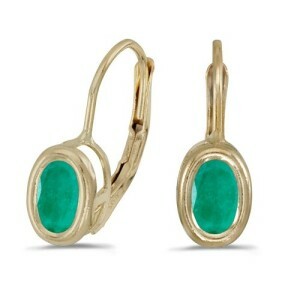 The emeralds in these earrings have been oiled to make the stones’ inclusions less visible. This is common practice, but you should keep in mind that you shouldn’t put treated emeralds in ultrasonic cleaners as the ultrasound vibrations can destroy the fillers. Instead, use a soft, damp cloth to clean dirt off your emerald. Sometimes, emeralds are dyed to enhance their color, but you should be aware that these stones are less valuable. Imitation emeralds are stones that are made of another material that makes them look like real emeralds. However, these stones are considered fake and are rather cheap. 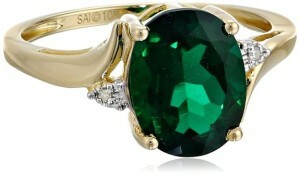 The created (or synthetic) emerald in this ring has the same chemical composition as natural emeralds. Synthetic emeralds (or created emeralds), on the other hand, are created in a lab and have the same chemical composition and physical properties as natural emeralds. Click here to take a look at a selection of lab-created emerald jewelry. Because they are made synthetically, however, these stones are more affordable than their naturally occurring counterparts. We recommend James Allen (read review) because you can take a 360-degree look at any emerald before having it set in a piece of jewelry. 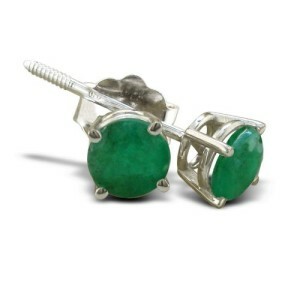 Also take a look at the vast selection of emerald jewelry at Amazon.